Most problems with the website can be fixed by simply logging in "the right way". It is possible to enter the system through other "doors", but the most reliable option is the top right Sign In button when you arrive at http://chicagoedgesc.com. So please try this step as a first problem solver. Some browsers don't save email/passwords up there when trying to log in. We had good success simply leaving those log in fields blank and hitting Return - the subsequent login page usually does save your login information, so you don't have to retype every time. If you forgot your password, click the top right Sign In button, enter your email address, leave the password field blank and click the Sign In button. Your password will be emailed to you. Once logged in, click on Admin (also top right). Click on anyone in your family to update their contact info. The cell phone tab lets you add a cell phone provider, so that you can receive text alerts about game reminders or changes. Once logged in, go to your team webpage and select Roster. Use the Send Email button on the top right. You can contact a team parent individually by clicking on their name, which will reveal their email address. Your coach and team manager expects you to update your status for every game by midweek. To let them know, log in, go to your team page, select the Schedule tab. On the right side you will find a Thumbs Up icon where you can click and update your status for a game. 48 hours prior to game time an automated email will be sent with game details. Even if you already updated your attendance status, the system will ask you AGAIN to confirm it. If you signed up for text alerts, then you will receive a game reminder text 2 hours prior to game time. Reminders will only go out for games, not practices. 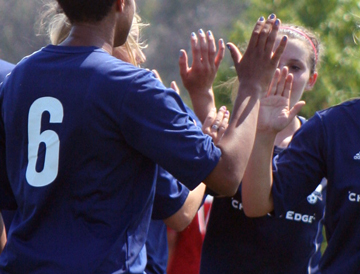 All U9-U19 Chicago Edge teams will participate in a winter indoor league. This was included in your registration fee. Most league play starts in mid November and runs up until spring break. For high school players league play will start in early November (frequently overlapping fall outdoor games) and run up until the IHSA deadline in late February for girls and up to spring break for boys. Most but not all winter indoor league games are scheduled on the weekend. Other games are on weekday evenings. Given the limited indoor space it is inevitable that there will be games at ”inconvenient times – late evenings, holiday weekends etc”. Each facility has a set of rules to follow. Most do not allow players to wear cleats on the turf. Players can wear indoor soccer shoes or athletic shoes. Generally only water is allowed on the field, as turf is difficult to clean. If you don’t want it dropped or spilled on your carpet at home it should not go out on a turf field. Depending on the facility where your team is assigned, the rules of the game may be different from the outdoor rules. Frequently subbing is on the fly and often times there is no offside rule. You will want to review the indoor league rules to avoid confusion. U9-U12 Teams: Each team will have one winter indoor team practice per week starting after winter break and running up to spring break at the local indoor soccer facility. The Directors of Coaching will assign your team a practice slot. Goalkeeping clinics will also be available. U13-U15 Teams: Each team will have twice weekly winter indoor team practices starting in mid-November and running 18 weeks up to spring break at a local indoor soccer facility. The Directors of Coaching will assign your team a practice slot. Goalkeeping clinics will also be available. High School Teams: For high school players, twice weekly winter indoor team practices will begin in early November and run up to the IHSA deadline in late February for girls and up to spring break for boys. The coaches would like for the players to wear their full navy uniform to all games and keep the red jersey as the alternate in their bags at all times in case of color conflict. 3) Talk to the referees or linesmen for any reason — yelling at the referees and questioning their decisions can get a parent ejected from a game. Referees will ask the coach to control his/her parents and the coach can get carded or even ejected if the bad behavior continues. If this happens the team will forfeit the game. Poor sideline behavior also causes our young referees and linesmen to leave in droves. No one is perfect. Remember that all these referees had to take an extensive course to receive their license. Once logged in, click on Edit My Account (left side vertical tab). Click on Family Schedule. On the subsequent page that displays all scheduled event, click Options and select Calendar Feed. If you experience issues with Google calendar not updating calendar changes, add this string at the end of your calendar feed: "?noCache" (without the quotes) - that forces Google calendar to refresh data as it is changed. Soccer is played in the rain and cold. If it’s a light rain, there will be practices and games. If there is thunder & lightning the players will be moved off the field to a nearby shelter if available. Please have a plan in place to pick up your players quickly if there is severe weather. Practice cancelations will be made using the club’s email system as early as possible (hopefully by 2:00PM) and the fields section of the website will be updated to show field status (green=open, yellow=watch for further notice via email, red=closed). Home game cancelations will be made using the club’s email system and/or team manager contact depending on the number of fields closing. Home game rescheduling will be communicated through your team manager. Away game cancelations and reschedules will be communicated through your team manager. Just because some home games are canceled does not automatically mean all home and away games are canceled that day!